Check out our BOM4.1 Omni Subwoofer. Connect up to 2 pairs of speakers! Your audio system doesn't have to have inferior sound just because it's located outside. You can still enjoy rich, crisp music in your very own backyard thanks to this OM-SUB200 Outdoor Omni Subwoofer from Outdoor Speaker Depot. 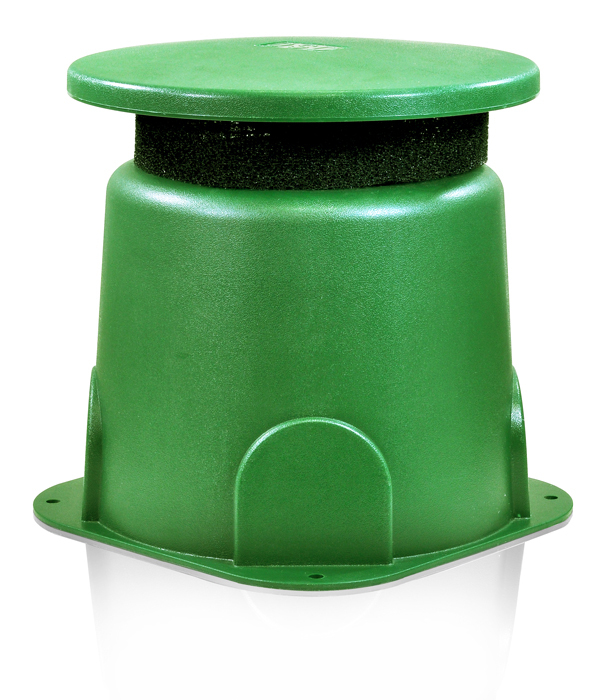 This audio unit enhances the bass in your outdoor speakers while also blending into your surroundings. 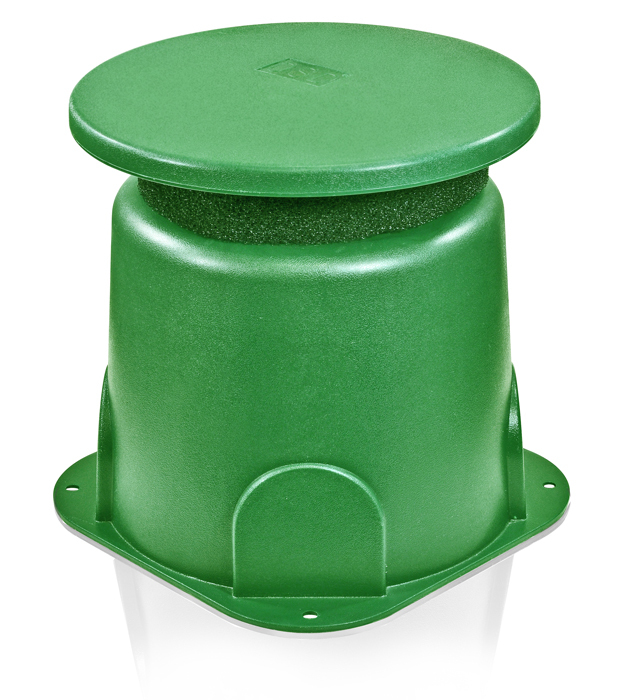 The green color is perfect for setting up in a yard or garden without looking conspicuous. 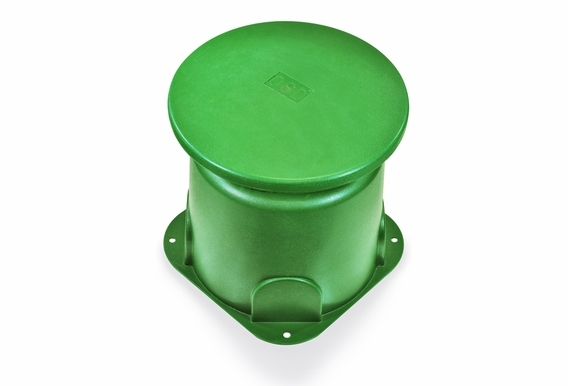 This little unit measures just 12 x 12 x 13 inches, so it fits in seamlessly in any outdoor space. Plus, it features weather-resistant materials that can withstand harsh weather conditions, including snow, rain and high temperatures. The incredible durability of the OM-SUB200 Outdoor Omni Subwoofer is backed by a one-year warranty. Setting up this Omni subwoofer couldn't be easier. Just plug your current speaker wires into the subwoofer to get the great sound you want. This 8-inch subwoofer offers incredible power in a compact space, so you'll get that same rich and deep sound you love from your indoor system. However, the unique design of the OM-SUB200 Outdoor Omni Subwoofer makes it ideal for outdoor applications, turning your backyard, patio, porch or deck into a cozy retreat that sounds like a live concert. 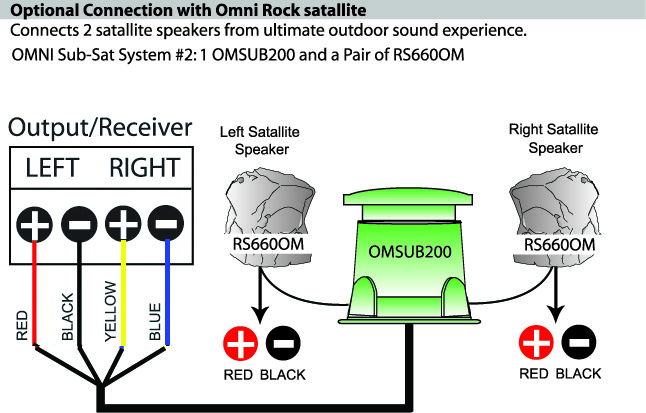 Our handy buying guides make it easy to determine whether the OM-SUB200 Outdoor Omni Subwoofer is the right match for your current speakers. If you're starting an outdoor audio system from scratch, we can also help you find the right outdoor speakers to match this subwoofer. We offer installation guides as well to make setup a breeze. And as always, you'll get free lifetime technical support on any of the products you order from OSD. 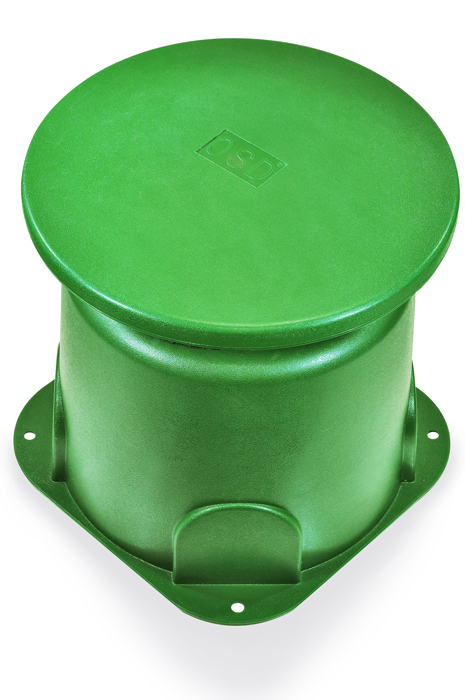 Dimensions: (L x W x H) 12" x 12" x 13"
Now it's easy to enhance the bass of your backyard system! Just plug your current speaker wires into the omni subwoofer. I have a pair of 670â€™s running on my patio off a Denon 2nd zone (2113ci I believe). Do I need an sub amp or can it just power these along with this sub? Can I connect this to my Nero - xd 200 watt amplifier and would it have enough power run it. 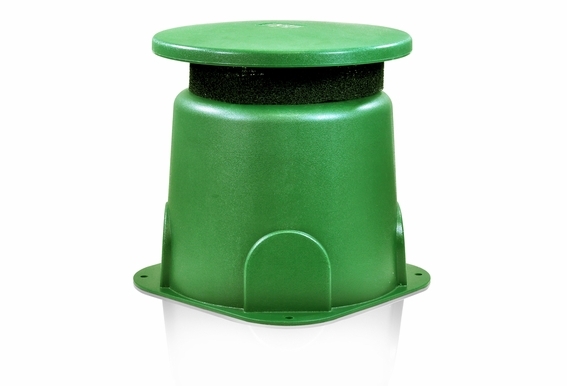 I want to add a subwoofer to a set of older outdoor osd patio speakers ( not sure which model). I am running these thru a iss6 speaker selector and have a volume control on each zone. About how long until the product is back in stock. ? Do you have to use a sub-sat setup or can you just connect this to the sub amp connected to the reciever pre out. I dont want to use a sub-sat setup. I have one pair of outdoor speakers and two outdoor subwoofers (one is this unit). I would like to use one subwoofer for each channel. Both outdoor subs have inputs for left and right channels (red +, black -, yellow + and blue - wires). What is the best way to wire this setup? I currently have one of these hooked up to a cheaper 2 channel stereo amplifier. My setup is from the amp/receiver on channel A is the OM Sub200 and from the sub I have two of the omni planter speakers. On channel B I have two of your 8" ceiling speakers (ICE800TTWRS) with only using one connection on each. 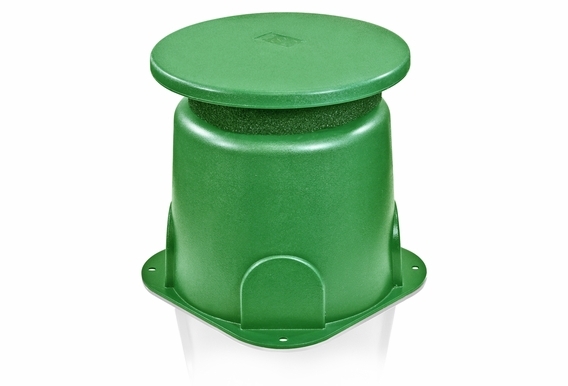 It sounds great, however I have two more planter speakers from you that I would like to incorporate in the system. 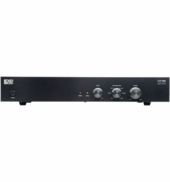 I have also upgraded my current in home receiver so now I have a Pioneer VSX-45 that I'm not using and I'm wanting to replace my current cheaper 2 channel stereo amp with this. If I would like to add the pioneer receiver and add two more planters, would I still need to purchase another omni sub? My concern is that I will have surround sound which is not what I am wanting. I want all of the speakers to play the same like I currently have. Any advice on how I can hook this up with my current equipment? I have added a picture of the back of my pioneer receiver. Thank you, you guys rock! I had asked about adding these to a pair of Yamaha NS-AW390BL speakers . I am using my 2nd room source output run to an Integra amp that is rated at either 100 or 125 watts per channel at 8 ohms which drives my Yamahas I don't have my spec sheet in front of me it does have different ratings for 4 and 6 ohm also believe that these areal 100 watts per channel or above?? From what you are telling me it sounds like this will work with adding this sub. The Yamahasl are really great on acoustic guitars and vocals. The 250 hz crossover seems a little high to me?? Would that affect the midrage sound on my Yamahas?? Thx for answering my previous questions Leaning towards this item because of price. Is this the same sub as the TIC Sb50 same price range looks almost Identical. Believe its specs are 25 hz to 125 hz which is lower than your speaks the majority of the reviews on your sub are better. Also looking at an Atrium but price is 3 times as high and it's low end rating is 50 hz. These specs all confuse me I just want nice clean extra bass response no boom don't care about that. I'm considering buying one of these to and to a pair of. Yamaha NS-AW390BL outdoor speakers I purchased they are tated 55hz to 40khz. Sense the low end spec on these is 50hz would I have amy improvement inmy sound and bass output?? What is the total impedance if you connect a pair of 8 ohm speakers after the subwoofer as suggested in the manual? I assume it would be 4 ohm unless the sub performs some sort of Impedance matching. Does this sub need to sit under a patio or can it be placed in a planter or an uncovered area of my back yard (if uncovered does it need to be brought in during the winter wet months)? Just purchased the OM-SUB200 and two OS790 8" satellite speakers and am using the OSD HD-OVC100 volume control (before the Sub). Would prefer to run the music in mono so that full sound can be heard at each satellite speaker. Powering them with a Russound P75 Dual Source amp using the bridged mode (requires a min of 8ohms) to increase the power to the sub and sats. My question is what impedance switch setting should be used on the volume control to achieve the required min of 8ohms? Not clear if the Subs satellite setup is wired in series or parallel. I am considering adding an outdoor subwoofer to go along with my (6) AP850 speakers in my cabana. My intenion was to have a sub that I could wire from my Onkyo Receiver's Subwoofer Pre-Out. So I guess my question is "if I am going from my receiver's subwoofer pre-out can it then be plugged into the OM-SUB200 Outdoor Omni Subwoofer?" Thanks in advance for any reply. I just bought this sub and 4 eight inch outside speaker. I'm hooking up the 4 speakers to speaker a on my receiver and want to connect the sub to system b. can i use two wire to go to the sub? how do it connect this to a denon avr 1912? Hi, I'm interested in getting an OM SUB200, connecting it to a pair of Yamaha NS-AW390 speakers, and driving all three with a Behringer iNUKE NU1000 Power Amp. If my calculation is correct, the total impedance of the sub + speakers would be around 3.4 ohms, and the NU1000 can deliver 2 x 500W at 2 ohms. Will this setup work? Are there any disadvantages or risks to this setup? I have 2 sets of your AP490 speakers and am planning on pairing them to a XMP100 amp. I'd like to run the SUB200 sub with them but not sure how the wiring would work with 2 sets (4 total) sat speakers. Would I need to use 2 SUB200's and hook each set of AP490's to the separate subs or will 1 sub work? Will the XMP100 power all of these speakers? I am trying to wire this sub but the wire coloring is throwing me off. I have Red, Black, Yellow, Blue wires on the main set on this sub Neither the Yellow or Blue is marked so which is which? I am looking to have 2 sub200 setups each running their own 2 OS790 speakers on each side of the yard. Is it possible to run that all in Mono? Would like to have that instead of a L & R off each sub. If so what type of AMP power do I require? Can you paint these? Everything around my pool is stone color and this green would stand out. 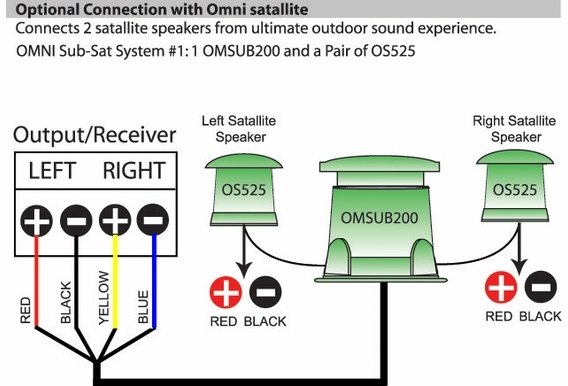 Can 6 ohm satellite speakers be connected to this sub? Just purchased this sub with a pair of the planter speakers. I am hooking them up to an outside tv. My question is what can I use to power them? Can I connect the sub and speakers to an amp then to the tv? Or do I need a receiver? I don't have a ton of room so would like somethingsmaller that is easy to control and not a fortune! How would I hookup two Sub-200's paired with the AP -650's to the Amp 300? Can this be achieved and will the amp 300 have enough draw to power two subs and 4 speakers? Is the amp120 amplifier a good choice for running this sub with some satellite speakers? I have recently purchased one OM-SUB200, two AP-520, two OS525 satellite speakers and I only have a SMP250 amp. I plan to set up the satellite speakers off this subwoofer but how can I tie all this as well as the AP-520s to the SMP250 amp? I also have a pair of AP525 speakers....will those tie in better than the 520's? please advise. thank you. Would I notice a reasonable difference if I add this sub to a pair of definitive Technology Aw6500 and a pair of Niles rock speakers or would the four speakers out perform the need for the sub? Hi Brad, Well, this is the most powerful outdoor subwoofer but it gets the job done and is very practical since it has a built in crossover, allowing you to run it off a standard stereo receiver. How does this pair with AP650's? I've mounted mine close to the ground. With 6.5" woofers in each AP650, will I need a sub? If I install a sub with such a high cross-over, will I really gain anything? Will the AP650's be overkill? Hi Jonathan, The AP650 actually have a good amount of bass response to where you probably wouldn't need an additional subwoofer. Try them out first and if you want more bass, you can always add the sub later! does this require 110 power ? or do you just wire it to your current speaker wires ? This is a passive subwoofer so you want to connect it to a stereo amplifier. It has a built-in crossover that will filter out the high-frequency sounds and only pass the low-frequency through to the sub. Can I connect to the output of the subwoofer to four speakers rather than just two ? Hi Joe, Really that depends on your amplifier. Adding four satellite speakers is going to give you an impedance load of 2ohms, so you would need to run it with a high-current amplifier such as our AMP200. Also, you probably will want to run a volume control between the sub and the satellite speakers so you can limit the volume of the stereo speakers, allowing you to use the sub to its full potential. Reason being because high frequency sounds require much less wattage to reach higher volumes, thus the satellite speakers will be too loud when the sub is at a very low volume. Hi Craig, Is the "Sub Out" on your receiver a speaker level output (speaker wire) or a line level output (RCA)? So, I want to add a sub and already have speakers above my patio. Can I just use zone B of my regular speaker outs to power this sub? I suppose I need to use both right and left channels on the B zone to make it sound right, correct? My receiver is a Sony STRDH750 if it matters. If I should look at a better Sub please advize. I already had Klipsch AW 500 running on this system. Thanks! Hi Stacks, This subwoofer has a built-in crossover, so it can run off a standard stereo receiver. You run both left/right channels into it. Can I hook two of these up to channel B and run 4 omni 8" off of them? What I have is the Amp300 running 4-8"ceiling speakers on channels A (4ohms per channel) and 2omni 8" on channel B. Was wanting to add 2 more 8" omni and a sub for each pair. Will this still give me a 4ohm load per channel? Hi Bobby, You can run one off Zone A and one off Zone B. That will work. This amp can handle down to a 2ohm load on each zone. I currently have a DenonDRA-345R its has just the basic set ups. a and b for two zones. I also have insignia 2 way speakers hooked to the system that sound actually well for low end price. but the problem im having is no bass. will the Omni sub work on my system and how would I wire it? Hi Gary, The subwoofer will add some bass response to your outdoor system, but it is not the most powerful subwoofer if you want that really booming bass sound. It's difficult to get that in an outdoor application like it would be in a home theater application. However, if you just want smooth bass sound, this will do the job. It has a built-in crossover that filters out high-frequency sounds and allows you to run stereo speakers off of it. Thus, you can run this subwoofer off a stereo amp/receiver by itself or with satellite speakers on it. If you do run your stereo speakers off the subwoofer, we recommend running a volume control between the sub and stereo speakers so you can turn up the subwoofer and lower the higher volume of the satellite speakers. Do I have to bury it? I want to put one on my deck. Hi Luis, You do not have to bury the speaker. You can set it anywhere! I have an open-air but covered back patio that is 22' wide and extends 10' off the back of my house. My $100 pair of Yamaha outdoor speakers from BestBuy are mounted about 10' up on the house wall under my covered patio (ie- 21' apart). Because of wiring difficulties, the only place I can put this OM-SUB200 would be on the patio deck directly under one of the Yamaha speakers. Is it a problem that the sub will be located very near one Yamaha speaker but 21' away from the other? I'm worried that whenever people are near the speaker furthest from the sub, all they will hear is too much mid- and treble-range with not enough base. Any thoughts? Hi Rodrigo, That should work just fine. You may want to run a volume control between the sub and satellite speakers because the high frequency sounds will be much louder than the low frequency of the subwoofer. Adding a volume control will allow you to turn the volume up to get significant bass while keeping the satellite speaker volume from getting too loud. how do I connect the Omni Subwoofer four wires to a two wire system? Hi Steve, What kind of receiver are you wanting to power it with? Can I set this up as a Sub-Sat system with a Lepai LP7498E? Hi Gil, Does this Lepai amplifier plug into speakers via speaker wire? 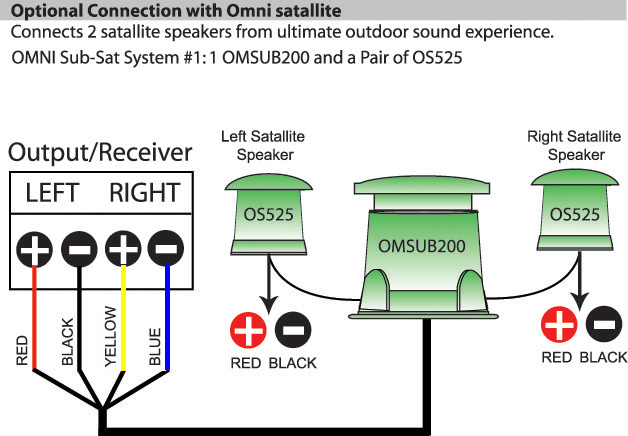 The omni sub will require a speaker wire connection to an amp, but you can run satellite speakers off the sub. It's recommended to use a volume control for the satellites so they don't over power the sub. I have a Onkyo TX8050 receiver. 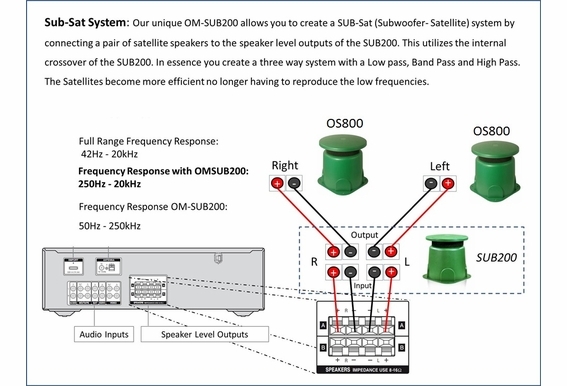 Can I connect this OM SUB200 in a satellite system setup for my outdoor deck? Hi Michael, This subwoofer can be powered by a stereo receiver thanks to the built-in crossover that will filter out the highs. You can run two satellite speakers off of it to receive the highs. It's recommended to run a volume control between the sub and satellites because the amp will power high frequency sounds much louder than low frequency. Add a volume control so you can turn the satellites down and be able to get sufficient volume through the sub. I have a 4 speaker system for my yard outside right now hooked up to a Pioneer 5.1 receiver. I am trying to figure out the best way to connect an outdoor sub woofer. I have done some research and see that this one has a built in cross over. I was wondering how would I connect it to the receiver? I need a good set of outdoor speakers and subwoofer to use with my christmas lights.. the speakers and amp must be able to plug into my computer audio card. Where can I set this sub up? Can I put it in the ceiling of my covered patio? how would you wire 2 subs and 6 speakers? Would both subs be wired to my amp and each sub would would be wired to 3 speakers? Hi. I'm considering a specific setup and have a few questions: First, can the OM-SUB200's pass thru be used to drive a 4-ohm load? The setup I'd like to try is a single OM-SUB200 along with two AP550TTs as satellites. The AP550TTs would be daisy-chained in parallel, creating a 4 ohm load. Assuming this scenario is possible, what load would the amp see? 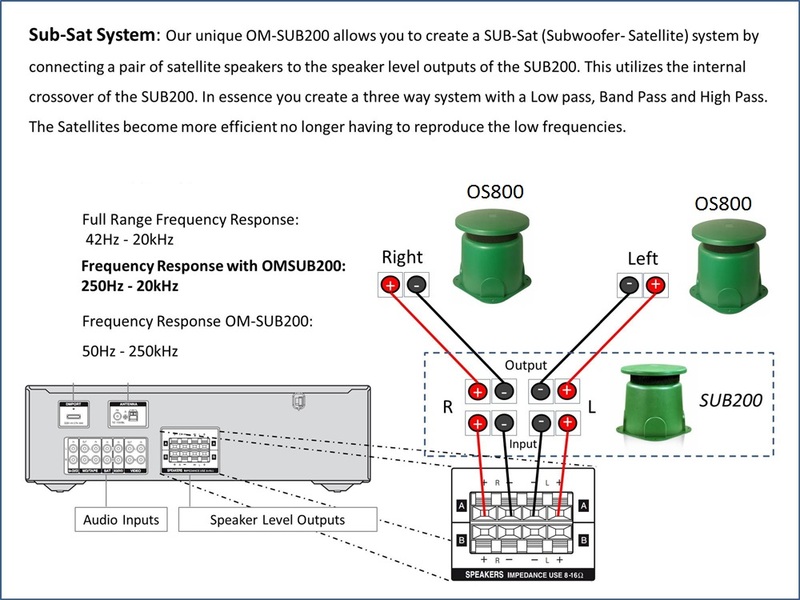 Second, could I use an OVC205R volume control in this scenario to control the OM-SUB200 and the AP550TTs? (I have a speaker selector box and don't need impedance matching here.) Last, this would all be installed for use on a deck. The deck is approx four feet off the ground. Would you recommend setting the OM-SUB200 somewhere on the deck itself, or burying it as per the manual underneath the deck? Thanks in advance. 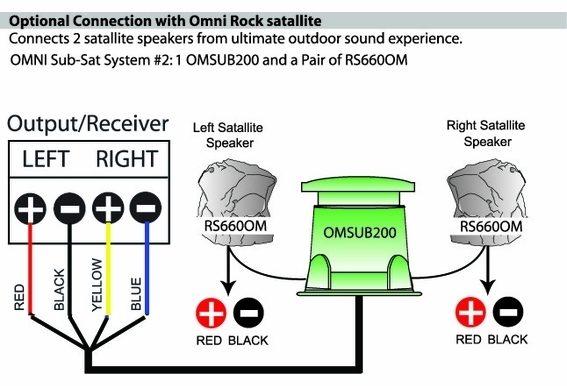 Can I use the om-sub200 outdoor Omni subwoofer with my WR800 Wireless Outdoor Speakers ?